We started fellowshipping (food, study, breaking bread) with a new and wonderful group of believers this week! We decided to do this by watching the first 3 chapters of The Visual Bible – The Gospel of John. I challenged everyone to read the first 3 chapters of John and come up with a single thing prior to our fellowship that spoke to them in our study of God’s word. It would seem that the fact that Yeshua could see Natan’el under the fig tree would be a miracle. Would we be correct in saying so? he serves the ordinary wine. So what is it that Natan’el says? 50 Jesus said, “Do you believe just because I told you I saw you when you were under the fig tree? What “greater things” will Nathanael see? Here is where you have to ask yourself a simple question . . . Consider that for a second . . . we learned above that the meaning of “greater things” means “all the more” – “to a greater degree.” Greater things than what? What is the object? Let’s do some simple logic if you are not understanding what I am saying. 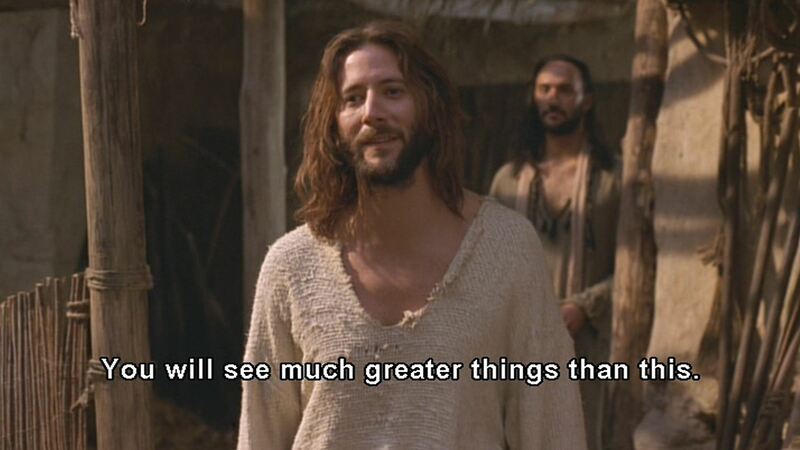 Again I ask what is the “greater things?” Isn’t Yeshua referencing that it will be “all the more” than “C” above? Isn’t Yeshua referencing that it will be “to a greater degree” than “C” above? 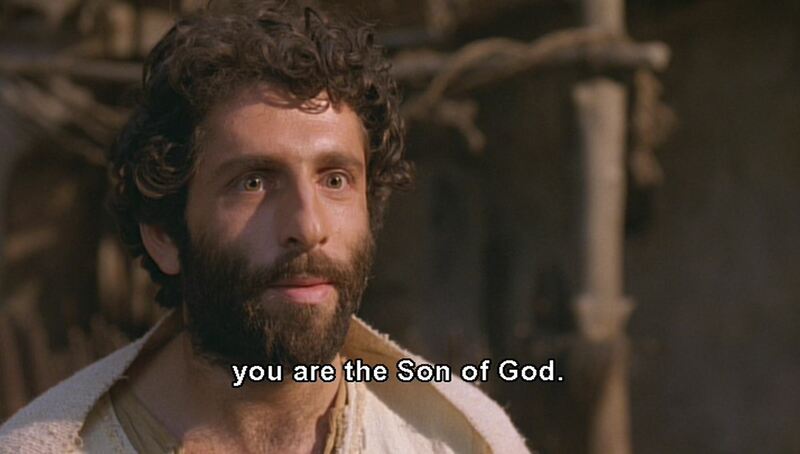 “Rabbi, you are the Son of God! 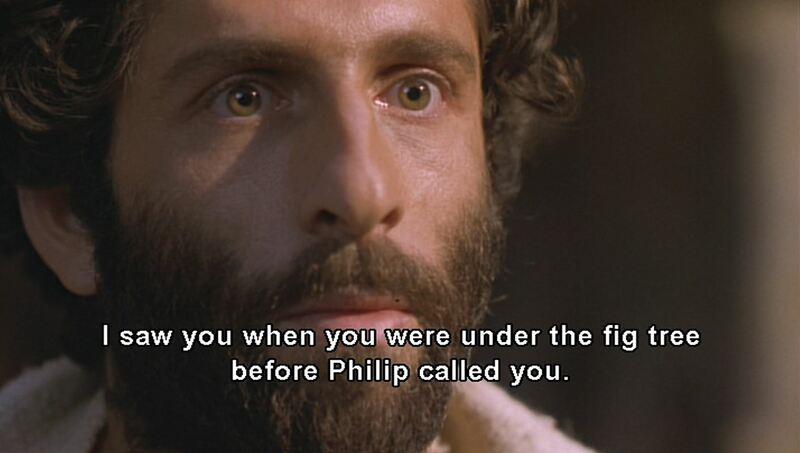 You are the King of Isra’el!”? Some of you may say, “The text is contradicting itself here then,” but it is not. 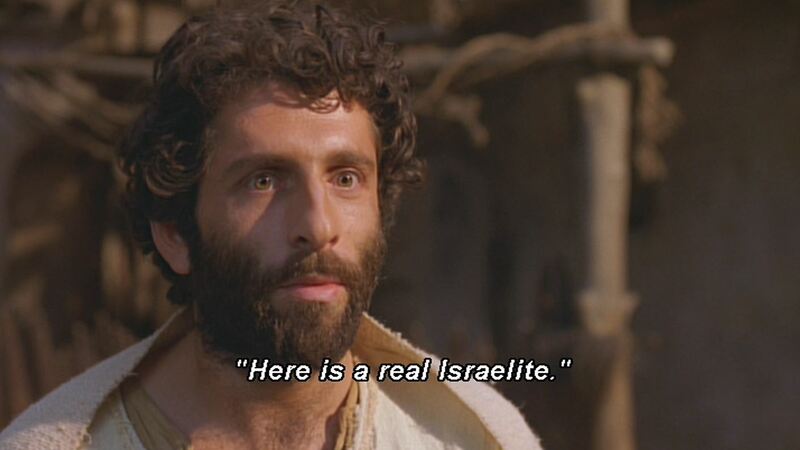 This is directed at Natan’el, and as a result, Natan’el believes and is the first to openly proclaim that Yeshua is the Son of God – The King of Isra’el. Nowhere before this do we find that any of Yeshua’s talmidim (discipiles) other than Natan’el believe that Yeshua is the Son of God – The King of Isra’el. Sometimes, there are things in the text which are ignored – glossed over – misunderstood . . .
Doesn’t Yeshua confirm that this with his own response? “you believe all this just because I told you I saw you under the fig tree? At the most basic level sēmeion (a noun related to sēma) denotes the “mark” by which something is known, a “sign,” especially in the sense of a sign of what will happen in the future. Thus sēmeion might be a “sign from the gods, an omen.” Sēmeion often includes a supernatural or wondrous dimension, and it might be described as a miracle (Liddell-Scott). Nonreligious usages include a “signal,” a “boundary” or “limit,” the “signet of a ring,” and a “birthmark.” Much of sēmeion, therefore, concerns its being a visual sign by which something is distinguished (ibid.). In the language of logic and reasoning a sēmeion is a “proof,” something which could probably be regarded as certain. Medically a sēmeion is a “symptom” (ibid. ; cf. Rengstorf, Kittel, 7:200-207). The translators of the Septuagint predominantly recognized sēmeion as the equivalent of the Hebrew term ’ôth (in various forms), a “sign, mark” (e.g., Genesis 1:14, the sun and the moon are “signs” for marking seasons; Genesis 4:15, the “mark” of Cain). Of theological import is the sēmeion of the covenant with Abraham— “circumcision” (Genesis 17:11), or the sign of the covenant with Noah—the rainbow (Genesis 9:12,13,17). God regularly offered signs as signifiers and reminders of His covenantal promises. This may involve a future circumstance (Exodus 3:12) or a supernatural event calling for belief (Exodus 4:8,9), or a reminder (Exodus 31:13; Numbers 17:10). God empowers His servants to perform signs (Exodus 4:17,28,30) with the result and intent that people can turn to God (Exodus 4:30; Numbers 14:11). But signs are no guarantee that belief will follow (Exodus 7:3,9ff. ; 8:23f. ; Numbers 14:22; Deuteronomy 29:3). In fact, disbelief or stubbornness may stimulate signs by God (Exodus 10:1; 11:9f.). “Signs” in and of themselves, however, are no guarantee of the reliability of a prophet or seer (Deuteronomy 13:1ff.). Rengstorf observes that in the Synoptics sēmeion is not used to describe Jesus’ miraculous works of healings, exorcisms, or miracles of nature. Rather, dunamis (1405), “miracle,” answers that call (“sēmeion,” Kittel, 7:235). He asserts the miracles prompt the demand for sēmeia, “signs.” What is at stake here is the rabbinic aversion to anything that even hinted at sorcery. They desired “proof” of Jesus’ identity because “miracles” were no guarantee of “orthodoxy.” They were seeking confirmation that it was God’s power at work and not human or demonic forces (ibid. ; cf. the debate in Mark 3:22ff.). I’m not so sure I am in agreement with Rengstorf. I understand the point he is trying to make and it has some merit, however, when we look at the dictionary entry on dunamis below and in the text, it would seem to be more about God’s show of power that results in miracles (signs) . . .
Greek philosophy in its earliest stages assigned dunamis an important part. Pythagoras’ numerological speculations afforded dunamis a place as the creative power of the kosmos (2862), the “created world.” Plato saw dunamis as the essence of existence. These theories were decisive for the development of the Hellenistic concept of God. Stoics spoke of a self-created, self-generating energy which governed the world; this force was identified as God. Whereas God in Platonic philosophy and in Aristotelian theory was transcendent, here God was held to be a neutral impersonal force—dunamis. This force disclosed itself in lesser deities—dunameis (“powers, demons”). On this basis the gods of the Orient were imported into Greek thought; thus the Greek world became Hellenized under the pressure of the spirit of the Orient (see Reinhardt, Poseidonius as cited by Grundmann, “dunamis,” Kittel, 2:288ff.). From this, Greek philosophy branched into more popular speculations about how these forces could be controlled, which led to the practice of magic. “Controlling fate” ordered the circumstances of a given individual in every aspect of life. Thoralf Gilbrant, ed., “1405. δύναμις,” in The Complete Biblical Library Greek-English Dictionary – Delta-Epsilon, (Springfield, MO: Complete Biblical Library, 1991), WORDsearch CROSS e-book, Under: “1405. Î´á½»Î½Î±Î¼Î¹Ï‚”. Jesus’ signs in John’s Gospel point to a significance beyond themselves. They positively outline Jesus’ ministry. For example, John marked time with the first sign (Cana, 2:11) or the second sign (healing at Capernaum, 4:54). Indeed, the positive place of signs is so pronounced in John’s Gospel that scholars have come to label chapters 1–12 as the “Book of Signs.” Interestingly, the only other instance of sēmeion apart from these chapters is 20:30—a verse telling that Jesus did many other signs, bearing witness that He is the Son of God. Signs are typically miraculous, and there is little indication that a superficially normal event was actually a disguised sign. Paul also revealed an understanding of signs shared by the Gospel writers: signs and miracles would be performed in the last days by false prophets through the power of Satan (2 Thessalonians 2:9). Jesus warned of this impending deception in His speech on the Mount of Olives (Matthew 24:24; Mark 13:22). John wrote in the Book of Revelation of evil spirits coming out of the mouths of the dragon, beast, and false prophet. These evil spirits work counterfeit miraculous signs all over the earth and deceive many (Revelation 16:14; cf. 13:13,14; 19:20). Thoralf Gilbrant, ed., “4447. σημεῖον,” in The Complete Biblical Library Greek-English Dictionary – Sigma-Omega, (Springfield, MO: Complete Biblical Library, 1991), WORDsearch CROSS e-book, Under: “4447. ÏƒÎ·Î¼Îµá¿–Î¿Î½”. 11 “Ask Adonai your God to give you a sign. This is the common Hebrew noun (78 occurrences) meaning “sign.” This noun commands a wide semantic range. One can divide this range into mundane and supernatural groupings. Covenants are confirmed by “signs” of intended faithfulness. Examples would be the employment of the rainbow as a sign to confirm the Noahic covenant (Gen. 9:12); circumcision as confirmation of Abraham’s lineage to fulfill their covenantal responsibility (Gen. 17:11); and verbal confirmation on the part of the Israelite spies in the house of Rahab to her request for immunity from the coming obliteration of Jericho (Josh. 2:12). This noun can also refer to commemorative markers. These can be in the form of monuments, such as the 12 stones piled upon the crossing of the Jordan by the tribes during the process of entering Canaan (Josh. 4:6). A commemorative sign can be an object, such as Aaron’s rod (Num. 17:10) or what later became phylacteries (Exo. 13:9). The blood of the Passover lamb and observation of the Sabbath are two more symbols of the eminence of Yahweh. Signs confirm oracular messages. Gideon asks Yahweh to give him a sign (Judg. 6:17). Eli’s rejection as high priest (as well as his lineage) was confirmed by the sign of the death of his sons (1 Sam. 2:34). Samuel’s oracle concerning Saul’s elevation to kingship was confirmed by signs fulfilled that day (1 Samuel 10). “Sign” also incorporates the concept of manifestation of power through supernatural means. In this sense, the manifestation is confirmation of the power vested in the individual making the covenant, namely Yahweh. 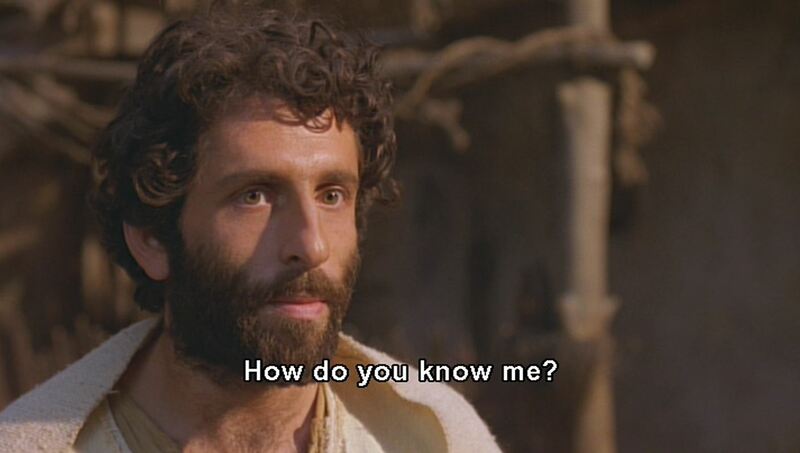 Signs can be mediated by individuals, e.g., Moses (Exo. 4:8ff; Deut. 34:11) or a false prophet (Deut. 13:1f). About 20 times, the plural of this noun refers to Yahweh’s sign of deliverance, the Exodus (Deut. 6:22). The entire world trembles before his power (Ps. 65:8; Jer. 32:20). Thoralf Gilbrant, ed., “225,” in The Complete Biblical Library Hebrew-English Dictionary – Aleph-Beth, (Springfield, IL: World Library Press, Inc., 1998), WORDsearch CROSS e-book, Under: “225”. can be juxtaposed against people such as Pharaoh who saw much greater things and had no trust . . .
Pharaoh saw locusts and frogs – he saw water turn to blood and hail with fire and wasn’t convinced. What convinced Natan’el? Was it a huge sign? Nope. Just a “thing” as simple as Yeshua calling him by name and telling him he saw him under that fig tree . . .
As I said earlier, sometimes, the small things in the text (things that are often missed), are the most beautiful! This entry was posted in Word Studies and tagged fig tree, first miracle, john, Natan’el, Nathanael, water, wine, Yochanan. Bookmark the permalink.